President Pranab Mukherjee has appointed acting chief justices to four high courts as the respective chief justices have been elevated to the Supreme Court. 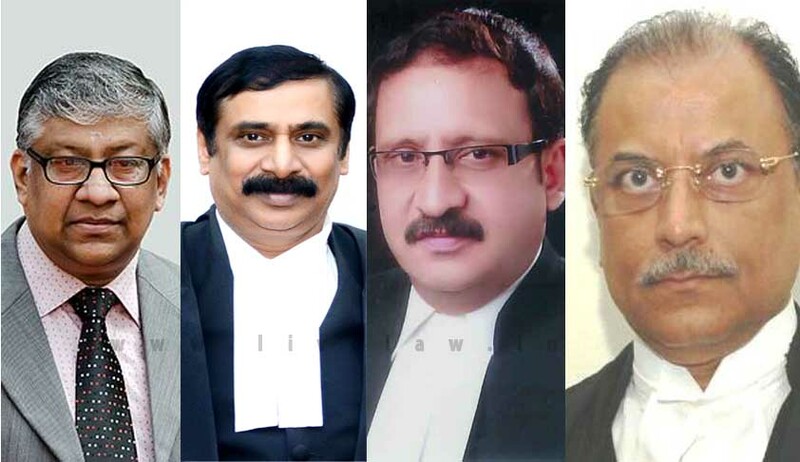 Justice Huluvadi Gangadharappa has been appointed as acting chief justice of Madras High Court, Justice Kalpesh Jhaveri for Rajasthan High Court, Justice Thottathil B Radhakrishnan for Kerala High Court and Justice Pritinker Diwakar for Chhattisgarh High Court. Rajasthan High Court Chief Justice Naveen Sinha, Madras High Court Chief Justice Sanjay Kishan Kaul, Chhattisgarh High Court Chief Justice Dipak Gupta, Kerala High Court Chief Justice Mohan M Shantanagouder and Karnataka High Court judge Justice S Abdul Nazeer will be sworn in as judges of the Supreme Court on Friday. As per reports, the Law Ministry has cleared the collegium’s recommendations for the appointment of chief justices to various high courts and forwarded the files to the PMO. The collegium recommended Justice Hemant Gupta for Madhya Pradesh High Court; Justice Abhilasha Kumari for Tripura High Court; Justice BD Ahmed for Jammu and Kashmir High Court; Justice Pradeep Nandarajog for Rajasthan High Court; Justice Rajendra Menon for Patna High Court; Justice T Vaiphei for Hyderabad High Court; Justice HG Ramesh for Madras High Court; Justice TB Radhakrishnan for Chhattisgarh High Court, Justice PK Mohanty for Jharkhand High Court and Justice Navaniti Prasad for Kerala High Court.